E-tailing Festive GMV | How has the Category Mix Changed? Report from E-tailing festive months. October'16: Electronics dominated the month due to high discounts on Mobiles and Large Appliances by top players coupled with other offers like No Cost EMI, Bank discounts etc. 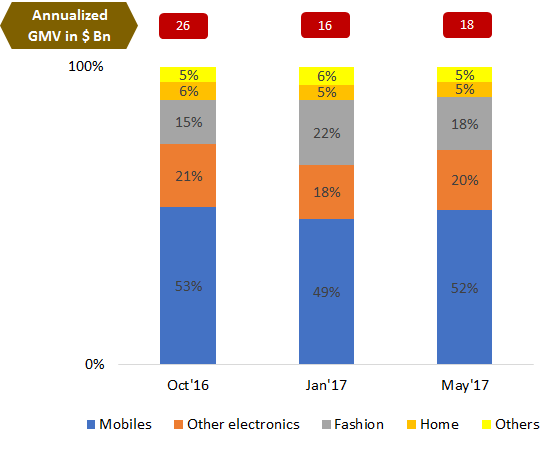 January'17: Although the industry remained electronics dominated, the share of fashion category increased due to the 'End of season sales' organised by most of the players. May'17: Share of mobiles and electronics increased from Jan'17 as exclusive mobiles were launched by top platform Flipkart and Amazon, as well as appliances, were highly discounted.